Jonathan Freedland, in last week’s Guardian, congratulates the UK Shadow Chancellor, Ed Balls, on being able to claim the rare privilege in politics of saying “I told you so”. Balls had warned in 2010 that austerity would not pull the UK out of recession – a prediction now in the course of being amply confirmed. It is certainly true that, for most politicians, claiming to have been proved right is rarely possible – and, even if it is occasionally justified, it is not usually a claim calculated to endear the claimant to his audience. So, Ed Balls is fortunate to have someone else make the claim for him. The claim is usually, of course, only of interest if it can be made by or on behalf of a frontline practising politician – someone who either does or might one day exercise the power of government, and whose fitness to do so would perhaps accordingly be enhanced. The claim is even more difficult to make – and of considerably less interest – if made by someone who has long since departed the scene. So why – 18 years after I decided to leave British politics – should I think it worthwhile to make that claim in my own name now? The answer is that I left British politics in 1994 because I despaired of being able to persuade my colleagues in the Labour party that they were pursuing the wrong course on a wide range of issues. And, since it is precisely those issues which have dominated news headlines over recent times, there is now the chance of assessing who was right and who was wrong. What were those issues? First, the dominant role assumed by the City in British economic policy, something enthusiastically endorsed and encouraged by successive governments. In 1986, I led for the Opposition when the Financial Services Bill was debated in Standing Committee, and warned repeatedly that self-regulation, “light-handed” regulation, or no regulation at all, would allow unregulated financial markets to subject us all to unacceptable risks – risks that eventually materialised with a vengeance with the Global Financial Crisis. Then, there was the euro. My argument that the euro, imposing as it did a single and inappropriate monetary policy on a wide range of diverse economies, could not possibly work, had been preceded by my opposition to the euro’s predecessors – the European Monetary System and the Exchange Rate Mechanism, both of which had failed. I was constantly dismissed as “anti-European”, despite my contention that it was the concept of Europe itself that was being put at risk. I was eventually stripped of responsibility for policy-making on this issue. And what about the current controversy over News International? I recall being invited to lunch by Rupert Murdoch in 1988. In retrospect, it is a reasonable assumption that he was interested in how malleable I might be (I was then the Shadow Trade and Industry Secretary) in responding to his ambitions. I remember little of the lunch but I am quite certain that I offered a less pliable prospect than some of my successors clearly have done since – and I remained throughout extremely concerned at and hostile to the dangers posed by the concentration of media ownership. And austerity? I salute Ed Balls for his foresight in warning that austerity by itself takes us further into recession, and that we need a strategy for growth. 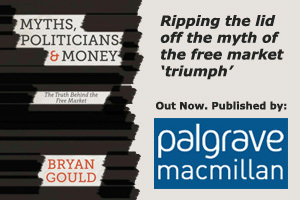 But we are saddled with the current sterile orthodoxy because we accepted in the 1980s that the “free” (or unregulated) market must prevail, so that – even in a recession – government must step aside to allow the market to re-establish equilibrium. I have spent most of my political life arguing that markets are irreplaceably valuable but not infallible. And, as long ago as 1981, I published – with two colleagues, John Mills and Shaun Stewart – Monetarism Or Prosperity? We argued that macro-economic strategy should be about much more than simply controlling inflation and that we needed a strategy for growth, focusing on full employment, competitiveness and putting the interests of the productive sector first. There are many other (and not just economic) issues on which I would claim that events have supported the views I took – the invasion of Iraq, for example, where I was clear long before the invasion that any such action would be disastrous. My purpose, however, is not to claim any special far-sightedness, since there have been many others who have expressed similar views on each and all of these issues. What I would claim, however, is that I was one of the very few in mainstream, frontline politics to have taken these views and to have swum against the prevailing tide. On all of these issues, in other words, we had choices – and we have suffered greatly from making the wrong ones.